If you've ever been stationed at an airbase or post with an active runway, you've no doubt seen C-130 and other airlifters move personnel and cargo through there on a regular basis. For those bases out in hostile territory where supplemental ground logistics is either limited or non-existent, airlift is the only supply line to keep personnel and equipment operational. Now imagine if that airbase is moving around one of the seven oceans of the world, some supplies can be taken along or delivered via special suppy ships, but essential and time-sensitive materials can only be moved by airlift. In the early 1960s, carrier airlift operations, dubbed COD (carrier on-board delivery) were performed by the C-1 Trader (a cargo variant of the S-2 Tracker), but the Trader's cargo carrying capabilities were very limited. In 1963, a C-130F was flown aboard the USS Forrestal to test the feasibility of using the Hercules in the COD mission. While the aircraft could get on and off the ship with no problems (no hook nor catapult either), the wingspan of the C-130 was pushing the safety limits of the flight deck and there was no way to get the aircraft onto the elevators and below deck, so if it broke while aboard ship, the carrier's deck was fouled until it could either dock or the offending Herc could be pushed over the side. A better solution was needed. The answer came from Grumman Aircraft Corporation (again). They had adapted their S-2 into the C-1 COD, and for the improved COD requirements, they built a new fuselage with a rear loading ramp for the wings and tail of the E-2 Hawkeye. This new aircraft was named C-2 Greyhound. Powered by the Allison T56 that also powers the E-2 Hawkeye, C-130 Hercules, P-3 Orion, and others, the C-2 can carry roughly 10,000 pounds of cargo over 1,000 miles and service all of the carrier battle groups at sea nearly anywhere in the world that duty calls. 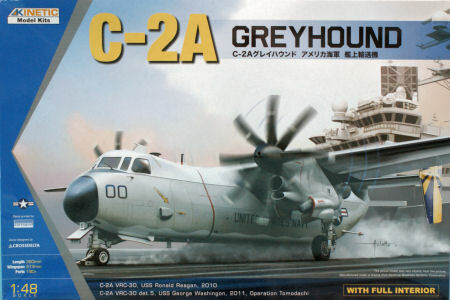 Kinetic is back with another new subject in 1/48 scale, the C-2 Greyhound. 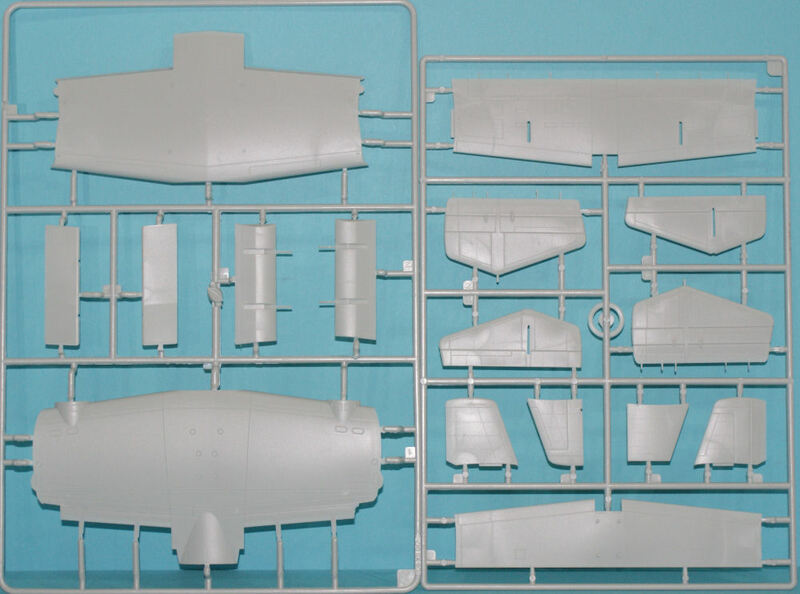 You might recall the first Greyhound kit released a few years ago by CollectAire in 1/48 scale and would be the first kit of this aircraft in any scale. While not bad in shape, CollectAire kits are produced in resin, tend to be challenging to build, and lacked panel lines on many of the kits surfaces (these were provided as decals in that kit). 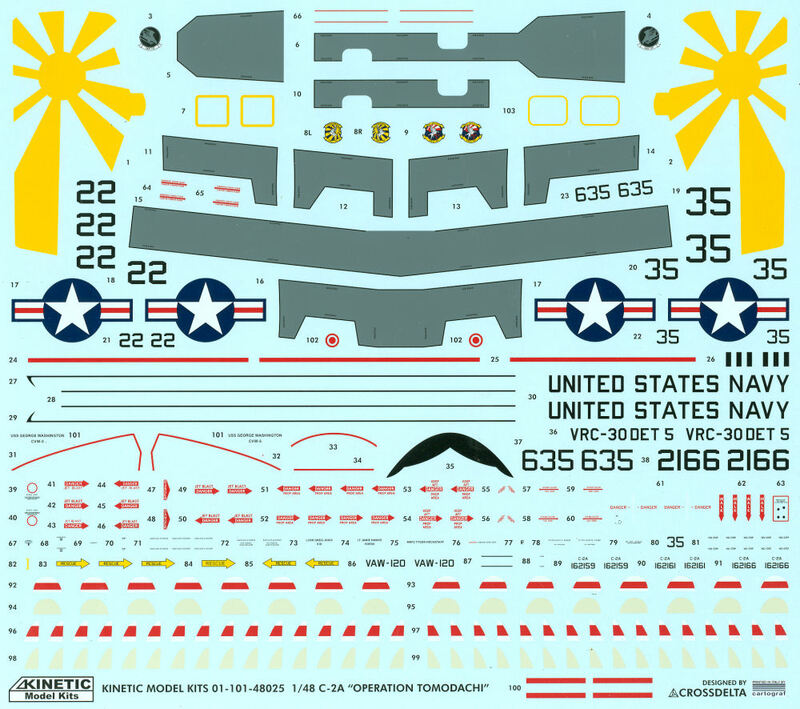 With this Kinetic kit, we have the first kit of this subject in plastic in any scale and it is based on their previously released E-2C Hawkeye kits (as was the full-scale aircraft). Unlike the CollectAire kit, this new release is loaded with details and promises to be a great build! Molded in light gray styrene, this kit is presented on 16 parts trees plus a single tree of clear parts. Duplicate parts trees are not shown in these images. As with the Hawkeye kits, the surface detailing is sharp and petite and there is no sign of the mad riveter. The kit provides lots of nice antenna details which you might want to reference against a photo of the aircraft you're modeling. The configuration in this box replicates the C-2A(R) post-SLEP Greyhound quite nicely and to backdate the aircraft, you'll simply eliminate or replace some of the antennas from sheet plastic or spares you might have available. 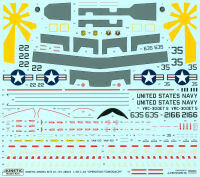 The decal sheet was produced for Kinetic by Cartograf and provides a complete set of walkways, maintenance and warning stenciling, and even the propeller tip warning stripes for both propeller types in the kit. Kudos to Kinetic for this beautiful model. Straight out of the box, this should build into a beautiful model and with some of the colorful schemes carried by this aircraft, you will have a nice addition to your scale flightline. Of course AMS modelers will have fun with this given all of the details already in the box, just a little time and patience will really set this model apart on the contest table!